The Oppo A7 comes with an amazing borderless display with a small recess at the top. With a screen resolution of 720 x 1,520 pixels and a 271-PPI 6.2-inch IPS LCD screen, it provides an excellent viewing experience. It is equipped with Corning Gorilla Glass v3 to protect the display. Under the hood, it offers an eight-core Cortex A53 processor with a clock speed of 1.8GHz and is located on the Qualcomm Snapdragon 450 chipset for outstanding performance. There is an Adreno 506 GPU that can smoothly process the graphics of the device. It has 3GB of RAM and can handle multitasking of devices. The smartphone comes with 32GB of built-in storage, which is great. It has an external memory slot that supports 256GB of scalability, which is more than what users need. It is powered by a 4,230 mAh Li-Ion battery that provides long-lasting power on a single charge to keep the device up and running. It also supports fast charging and provides users with extremely short charging times. The camera department of the device is very interesting, with a dual rear setting of 13MP + 2MP, which can capture very beautiful user photos. The front camera has a 16MP lens for stunning selfies that users will love. 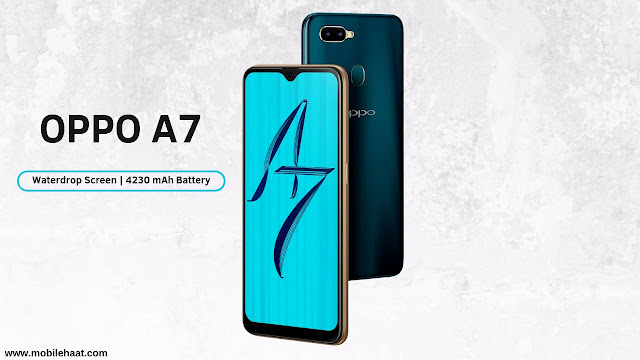 For connectivity, the Oppo A7 has dual 4G support. Other connectivity options include Wi-Fi 802.11 with mobile hotspots, Bluetooth, GPS with A-GPS, Glonass, and more. Processor: Octa core, 1.8 GHz, Cortex A53. Graphics Processing Union (GPU): Adreno 506. Body: 155.9 x 75.4 x 8.1 millimeter. Sensor: Fingerprint (rear-mounted), accelerometer, proximity, compass. Display resolution: 720 x 1520 pixels. Display Protection: Corning Gorilla Glass 3 - Color OS 5.2. Colors: Glaze Blue, Glaring Gold. Camera resolution (back): 13 + 2 Dual megapixels. Camera factor (back): Continuous Shooting, High Dynamic Range mode (HDR) Digital Zoom, Auto Flash, Face detection, Touch to focus. Camera resolution (front): 16 megapixels F2.0. Battery type and performance: Non-removable Li-Ion 4230 mAh battery. WLAN: Wi-Fi 802.11 a/b/g/n, WiFi Direct, hotspot. USB: micro USB 2.0, USB On-The-Go.